March 26, 2013: THIS VEHICLE HAS NOW BEEN SOLD. After three full years of continuous adventure travel, we're settling back down and are selling the eXtreme Unimog RV that was our back-country base of operations. This expedition-class vehicle has taken us to all manner of off-road destinations throughout the southwestern deserts, up west coast forest tracks and down east coast jeep trails -- never letting us down, keeping us warm and secure through the coldest nights, and enabling what we otherwise could not do. 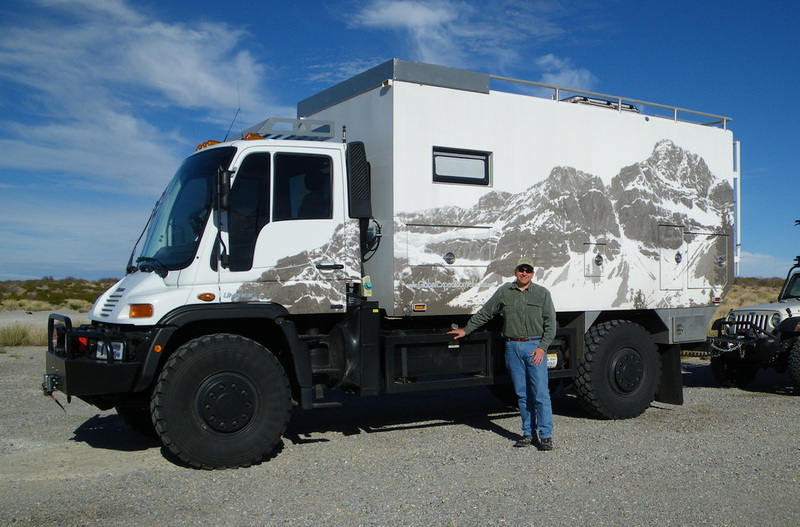 This eXtreme RV (XRV) was the first one produced by Global Expedition Vehicles and, due to its unique construction, is also the toughest camper they've ever produced. Having spent over $600K building it, the company's owners used it the following year in a successful tour of South America (GXV Story). When they returned, they upgraded and refurbished the camper, integrated it with a new Unimog U-500, and in early 2009 my wife and I purchased the resulting XRV from them and that's what you see above. This XRV is in excellent condition, has less than 39K miles on the chassis, has had further enhancements and refurbishments along the way, and is fit for immediate long range travel. Currently located in San Diego, we are offering the vehicle for sale at $185,000 USD. Details and photos can be found here and of course don't hesitate to contact me directly with questions or feedback even if you are not in the market -- I'm always happy to talk Unimog and about independent overland travel.